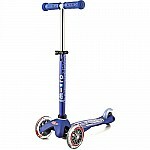 The Micro Sprite is our highest rated 2 wheel scooter for ages 8 and up. 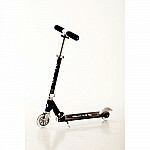 It offers a lot of Micro quality and style for a great price. With its cool colors and fantastically smooth glide, the Sprite is everyone's favorite-from middle school students to moms and commuters. 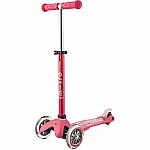 The Sprite is strong and lightweight, only 5.5 lbs, with an adjustable height handle bar that extends 34" above the deck (37" above the ground) and a maximum rider load of 220 lbs. 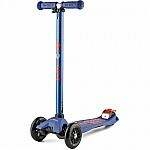 It's also a great travel and commuter scooter-it can be folded up quickly and easily for carrying or storing away, and the built-in kickstand allows quick upright "parking." 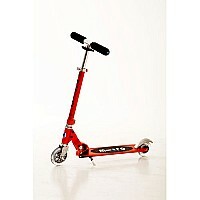 Measures approximately: 29.00 x 12.00 x 6.00 inches..